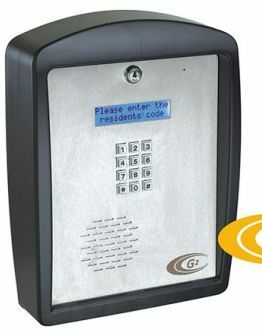 The B1000 and G2 are designed to provide resident or visitor access Control for multi unit establishment. 7A 12V Battery for extended battery life. There is no question about it – we all understand the importance and necessity of safety nowadays. This does not necessarily originate from excessive or ungrounded paranoia. The truth is that you never know when something might go wrong, and we all would appreciate the opportunity not to worry about this. With modern urban living, most of us spend at least part of our day in areas or buildings where many people come and go continuously. You don’t know every single person, so how can you have peace of mind that none of them hold a potential threat to you, your loved ones or your belongings? The B1000 Telephone Access Control System could help you answer this question. A significant amount of people live in apartment block, townhouses or clusters and most of us work in office blocks or business parks. These developments boast high traffic at almost any given time and therefore often provide plenty of incentive for unwanted elements of society. This necessitates the need for controlling access to the premises, while keeping it simple and convenient enough for the people who actually need to use the facilities. 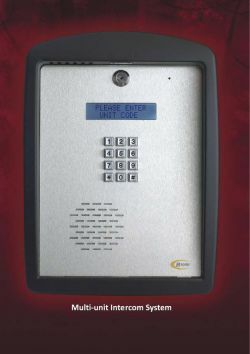 One of the most popular and effective ways is by using a telephone access control system. There are many of these systems out there, so what makes the B1000 so special? While telephone-based intercom systems have been available for quite some time, they rely on a fixed line or wired connections to operate. This makes them vulnerable and much more susceptible to interference or malfunction. The B1000 is the only system that operates on a dedicated cellular network. It is also the only system of its kind that can be managed and updated via a secure website, making it much more user-friendly. This certainly places it in a class of its own. It has a capacity for up to three numbers per dwelling or unit and has the ability to operate a multiple number of gates. It also has a vital battery back-up, ensuring that it keeps on operating unaffected during power failures. The B1000 Telephone Access Control System is available through Tandem Security. Browse tandemsecurity.co.za for this and many other security solutions. A cellular unit can be installed into the gate motor. 999 cell phone numbers can be programmed into the memory. If it receives a missed call from one of those numbers, the gate opens. The visitor uses his own cell phone to contact the resident. There are no monthly costs involved. This is ideal for small complexes.